“I missed you guys,” Phil Collins said upon taking the stage at Washington, D.C.’s Capital One Arena Sunday evening. To great fanfare the English rocker had trudged to center stage, cane in hand, and sat upon a stool. This has been Collins’ setting due to health woes that range from nerve damage to a fall last year—the collective sum of which has left him unable to play drums or many of the other instruments he once mastered. No matter. The 67-year-old, on his first tour in a decade, wouldn’t let a hobble or anything else stop him from leading a 13-piece band in a rousing two-hour set that included much of Collins’ solo hits interspersed with some covers and, of course, some Genesis tunes. Collins opened with a two-shot of “Against All Odds (Take a Look at Me Now)” and “Another Day in Paradise,” gamely tackling the vocal ranges of both songs despite both being transposed several steps down from their original keys. Collins sent the energy to the back of the house even from his seat, with the curtain behind him rising during “Paradise” to reveal his spirited group of backing musicians. “About 300 years ago, I was in a band called Genesis,” the rocker said to a thunderous response, then launched into a mini set of “Throwing It All Away” and “Follow You Follow Me” from the catalog of the vaunted band that once also included Peter Gabriel. “Invisible Touch” from the Genesis oeuvre also made a late-show appearance. 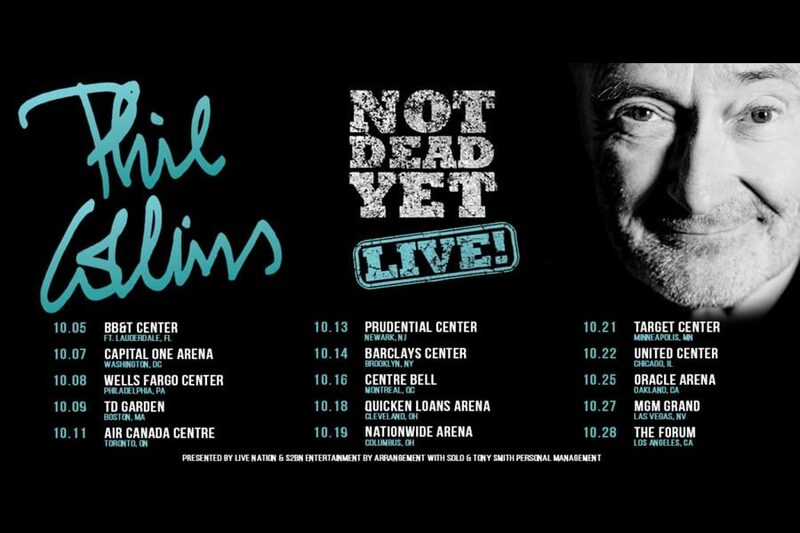 Unsurprisingly, “Not Dead Yet” is a bit of a family affair, with Genesis guitarist Daryl Stuermer backing Collins on guitar—and a second Collins behind the drum kit in the form of Nic Collins, the 17-year-old son of Phil. The younger Collins showed the family chops on percussion, a job he shared with Richie Garcia on a second set of drums (no surprise there). Both of the Collinses and Garcia gave the audience a midshow percussion show at center stage, with even Phil Collins offering some seated hand-drumming as well next to his son and Garcia. It’s a reminder, however bittersweet, of the great drumming Collins is known for, but which he can no longer accomplish due to his health. Nic Collins also joined his pop for a duet on “You Know What I Mean,” playing solo piano as his father sang the old tune. Phil Collins again made the audience laugh relating how Nic had found one song of his that he liked, “but just that one song,” and then insisted the father-son duo play it during the tour. The evening’s highlight was unquestionably “In the Air Tonight,” with Collins silhouetted at center stage on the radio staple, and his son delivering the famous drum roll mid-song that has become such a staple of popular culture that even Mike Tyson imitated it during a rather famous scene in the original “Hangover” film. The final songs were of a party atmosphere, with the entire band joining Collins at center stage with their instruments and choreographed revelry on “Dance Into the Light,” a cover of the doo-wop ‘60s song “You Can’t Hurry Love,” “Invisible Touch” and a rousing “Sussudio” as the closer, after which Collins and his entire band took a bow. Maybe he still “can’t dance,” but Collins has shown that despite years of trouble with alcohol, band strife and various health woes, he is, indeed, not dead yet.